By using these premium themes, you can create professional e-commerce websites with complete mobile support. All of these themes are provided with instant support and update facilities. If you are looking for a modern, reliable theme for your next e-commerce website, you can use any of these themes without any hesitation. Flat is a very popular WooCommerce theme, which also comes with great support for mobile and tablet devices. In order to improve your mobile site’s performance, Flat lets you disable the slider and enable the faster loading menu for mobile devices. The mobile visitors will also be able to enjoy various features of the desktop site including filtering the categories, using the accordions, adding items to the wishlist, using the shopping cart etc. With a fully responsive layout, uDesign is an extremely popular WooCommerce shopping theme for WordPress. The theme comes with multiple dedicated menu styles for mobile devices. And if you want, you can easily assign a different logo for the mobile version of your online store. It is also possible to pinch-zoom images in the responsive mode and disable the fixed position of the navigation menu for mobile devices. Based on Bootstrap Framework, NastCreative is an SEO-optimized WooCommerce theme with complete mobile support. As the theme is mostly based on CSS, mobile visitors will enjoy a faster page loading experience. The retina-ready theme looks great in smaller screens with higher pixel density. As the theme is provided with the po and mo files, you can easily translate it into other supported languages. Wendy is a creative WooCommerce theme with six different layouts. 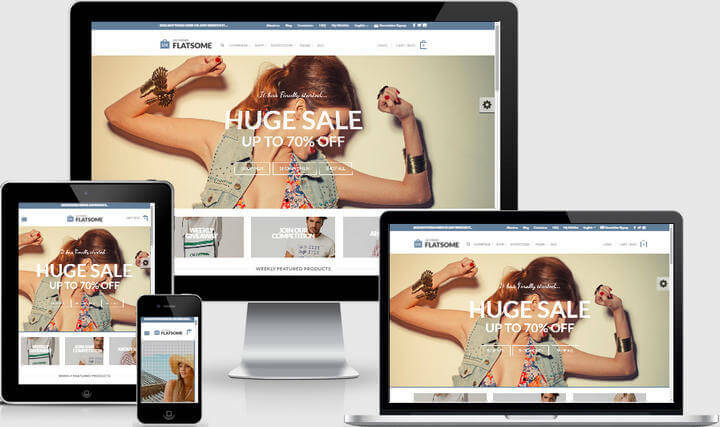 By using the fully mobile optimized theme, you can easily create attractive online shops. 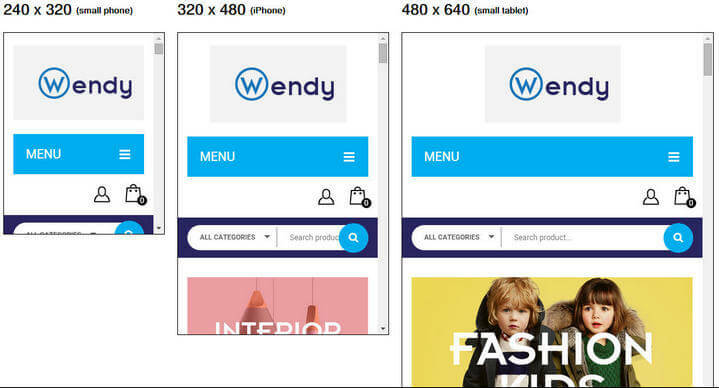 Wendy allows you to impress your mobile visitors by using the smooth animated menu, AJAX-powered shopping cart, product zooming and wishlist features. Mobile visitors can also compare between multiple products. It is possible to customize the design of the theme from the powerful theme options panel. Featuring a powerful one click demo installation feature, Magnium is a fast, powerful WooCommerce theme with full mobile support. The flexible theme comes with an adaptive layout powered by Bootstrap and a responsive menu powered by MegaMenu. As the theme package includes the PSD files, you can easily customize the design of your theme. You can also create beautiful page layouts by using the built-in Visual Page builder plugin. Illusion multipurpose WooCommerce theme is provided with a fully responsive layout. The retina ready layout of the theme is complemented by interesting features like smart search, mega menu, category grid view, lightbox effects, optional cookie control, product comparison, drop-down shopping cart etc. By importing the included demo content, you can easily get your online store started within minutes. If you want to provide any important update and/or notice to your mobile visitors, you can easily do that by using the Static head content feature. If you are looking for a multi-lingual WooCommerce theme with top-class mobile support, GoodStore could be an excellent choice for you. Besides English, this gorgeous looking theme also includes complete translations for other languages including Russian, Dutch, Italian, Swedish, Greek, Deutsch and Croatian. For the mobile visitors, you can choose from the two different menu types and customize the menu color too. Featuring a mobile-friendly layout, Butiko is a very popular WooCommerce theme for WordPress. The feature-rich theme works perfectly in any mobile device. You can easily customize the visual aspects of your theme from the theme options panel. As the theme supports YITH wishlist, mobile visitors will also be able to enjoy the wishlist feature. 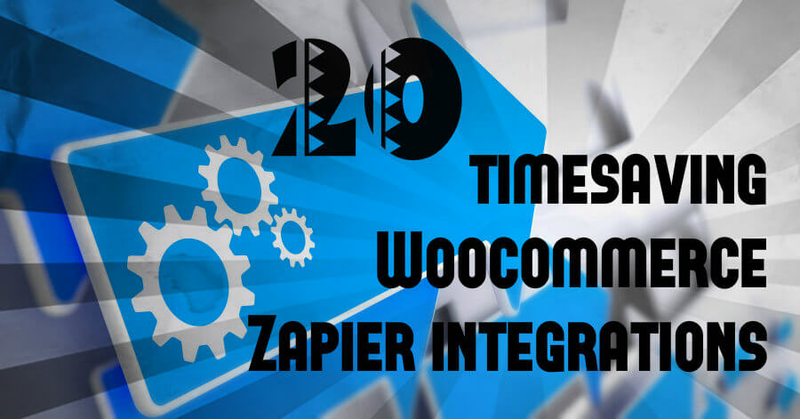 Other useful features include seven custom widgets, multiple premium plugins, different home page layouts, complete Google Fonts support, CAPTCHA support etc. With a strong focus on delivering a smooth user experience for the smartphone and tablet visitors, Suave is a gorgeous, powerful WooCommerce theme. The mobile-friendly layout of the theme looks great in retina screens. It is possible to increase the viewport by customizing the height of the mobile headers. You can also choose any of the ten different home page variations. And the sidebar could be placed in either the left or right side. 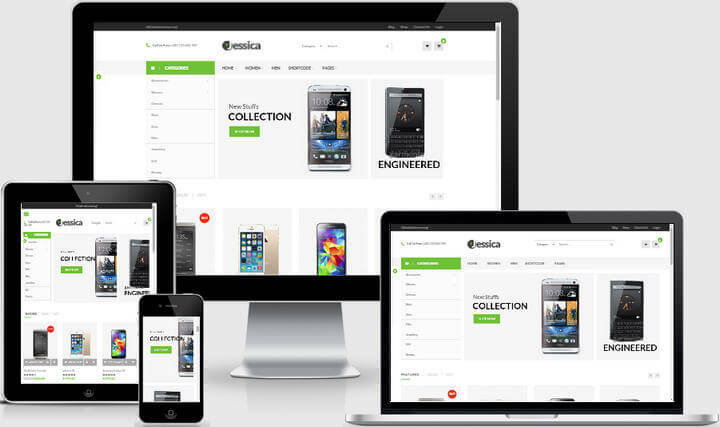 Classico is an elegantly designed e-commerce theme which looks great in phones, tablets and any other handheld device. 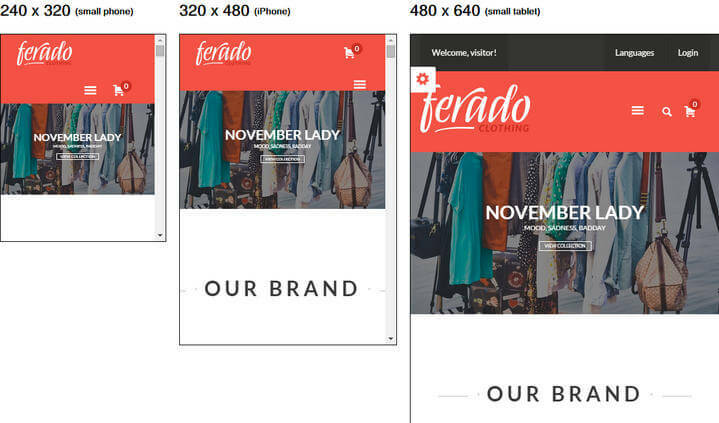 When using the theme, you can easily impress your visitors by presenting the optimized mobile version of your website. 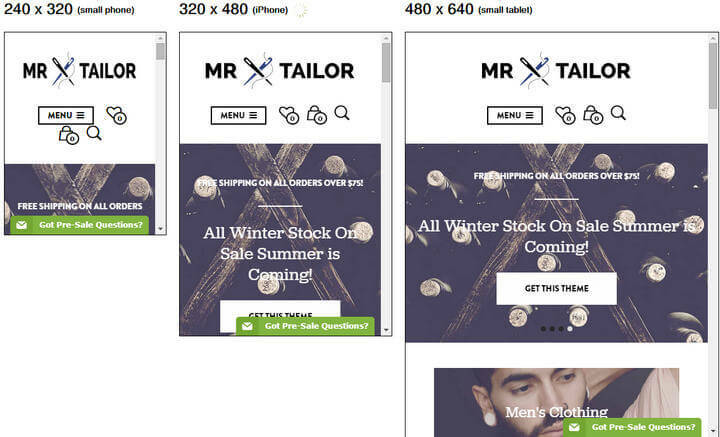 You can also create attractive looking pages by using the integrated drag and drop page builder. Depending on the structure, the sidebar and/or the widgets will be automatically disabled for the mobile visitors. The adaptive design of Jessica makes sure that your e-commerce site looks great in both mobile and tablet devices. As the theme is provided with several layouts for the home page, you will never run out of ideas for developing a unique front page. Additionally, it is also possible to use multiple headers and footers. By using the vertical menu feature, you can ensure more viewable area for your mobile visitors. The theme package also includes several premium plugins. Ferado is a fully responsive, retina ready WordPress theme with complete WooCommerce integration. The elegantly designed theme is provided with six different color schemes, multiple header styles and a powerful page builder plugin. As the theme follows all the coding best practices, your mobile visitors will be able to enjoy a fast and smooth page loading experience. By using the custom shortcodes, you can create custom elements without having to create them from scratch. Powered by Twitter Bootstrap framework, Accessories is a fully responsive WooCommerce theme for WordPress. The performance-optimized coding of the theme makes sure that the mobile visitors are getting the maximum performance from your website. The one click demo installation feature enables you to get your site started in no time. You can also communicate with your visitors by using the attractive blog section. The zippy performance on mobile devices is one of the main reasons behind the huge popularity of Mr. Tailor among its users. This modern, dynamic WordPress theme could be an excellent choice for developing your next e-commerce website. The custom tailored Visual Composer plugin will let you create attractive layouts within a few minutes. You will also find the detailed documentation and video walkthroughs very useful. 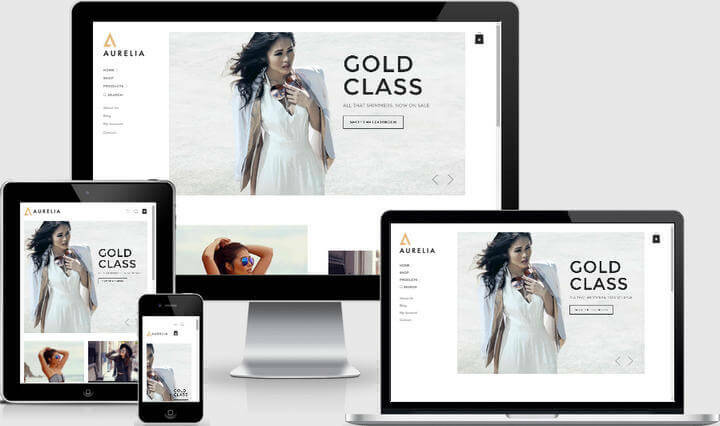 Aurelia is an excellent WooCommerce theme with a mobile-first approach. Besides the responsive layout, the powerful WordPress theme also comes with several conversion optimization features. The simple design of the product, checkout and shopping cart pages look great in mobile devices. 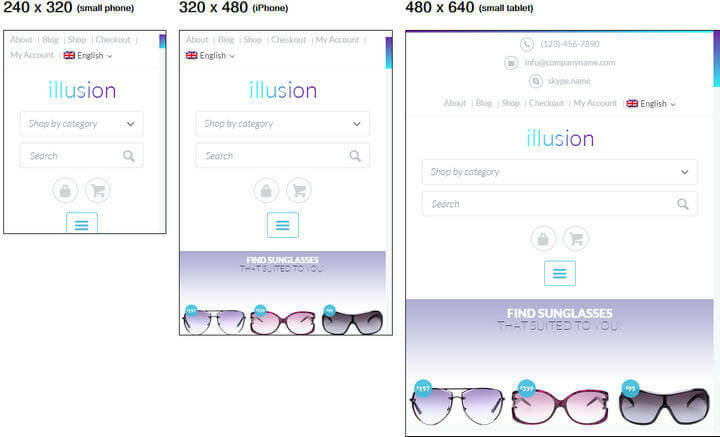 Mobile users can also zoom any product image and enjoy the stunning parallax effects. The SEO-optimized theme is retina ready and translation ready too. 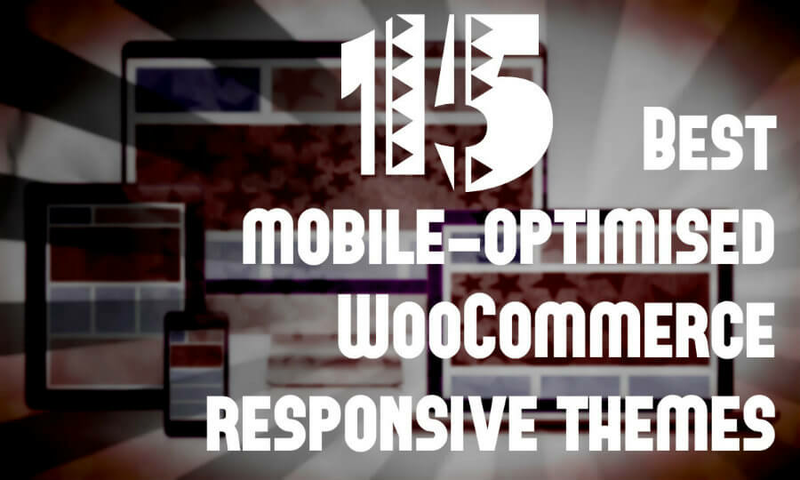 So, these were my picks for the 15 best WooCommerce themes for mobile. Let me know which one you like the most. And if you are using any of these themes in your website already, don’t forget to share your experience with us.